Eating at an Indian restaurant can be a “double edged sword” kind of an experience for a person of Indian descent. On the one hand, INDIAN FOOD! On the other hand, you always question how good the meal will be or if it will compare to your mom’s home cooking. 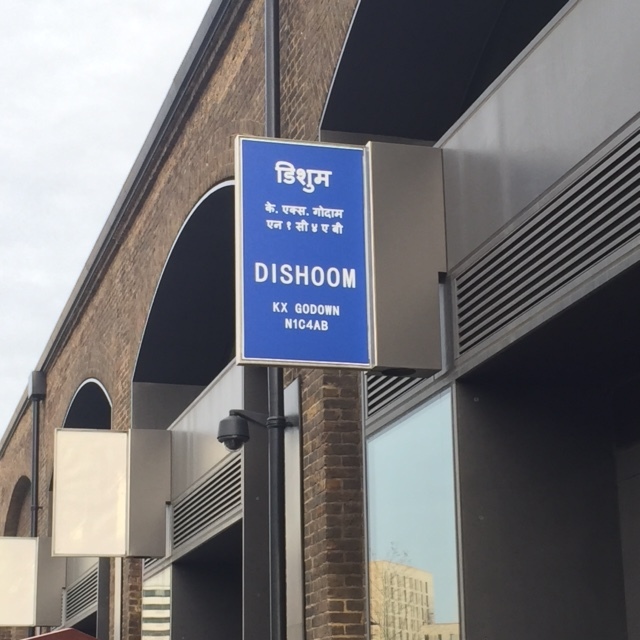 When everyone I know insisted that I eat at the restaurant Dishoom in London, I knew this would not be one of those experiences. It was likely going to be one where I wanted to lick my plate clean. And it so was! Five of my coworkers and I headed to the King’s Cross location on Thursday afternoon for lunch. For being such a popular restaurant, the entrance is not very grand. In fact, I would’ve missed it altogether had I not been with other people. The inside of the restaurant, however, is beautiful and very open. Unlike other Indian restaurants I’ve been to, this one has a very modern and clean feel. The menu is representative of that as well – lots of traditional dishes like daal, mutter paneer, paneer tikka, etc. 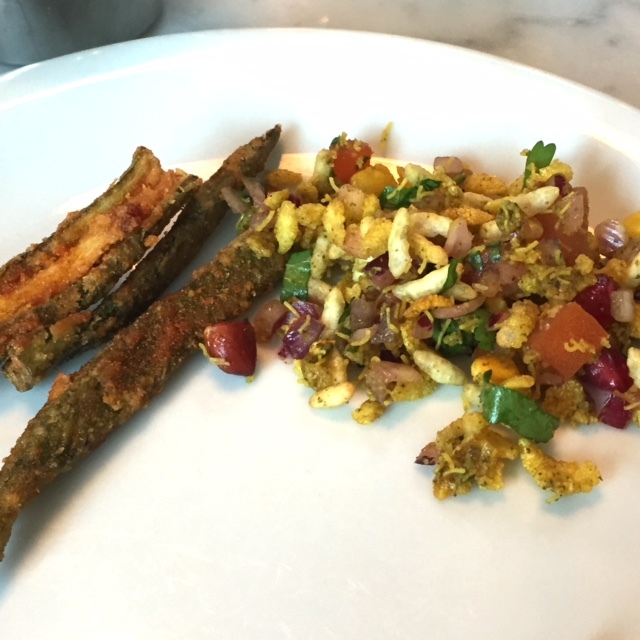 alongside unique/fusion dishes like a mango and paneer salad, slaw, etc. It was so hard to choose what I wanted! Luckily for me, my coworkers were up for sharing a number of dishes. We started with sides like far far (fried Indian snacks made from rice flour), bhel (puffed rice, nuts, pomegranate seeds, and a few other yummy things), okra fries, and chole bhatura (chickpea stew and a fried puff bread). 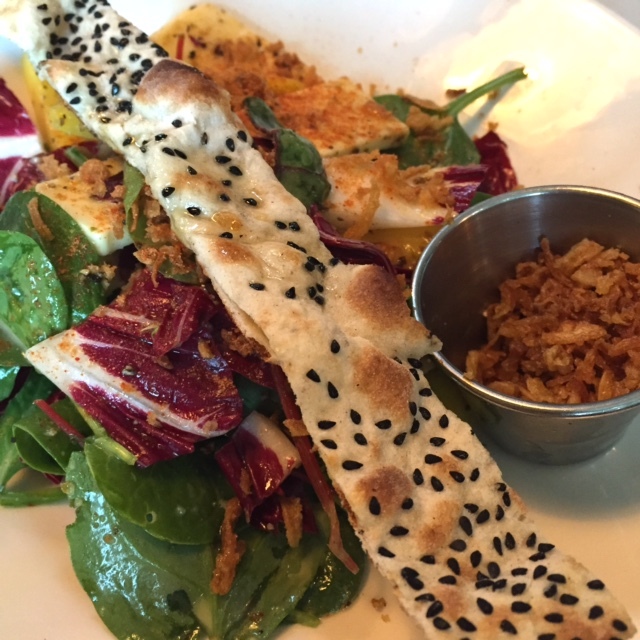 We also shared the mango and paneer salad and black daal (creamy lentils). 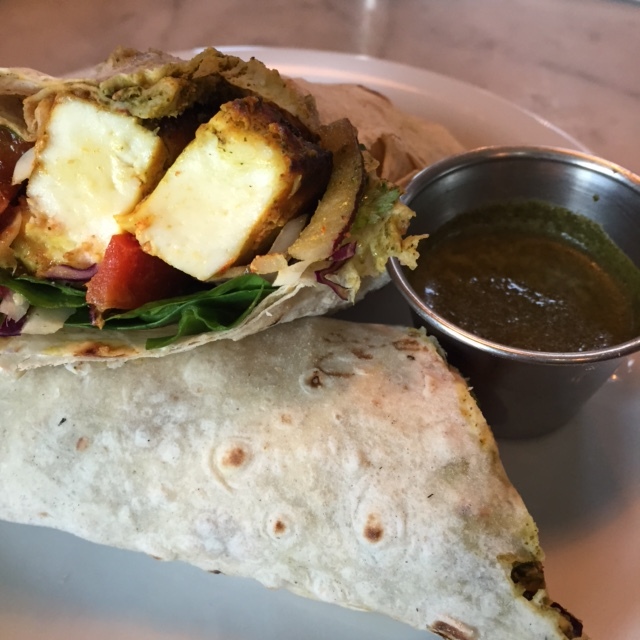 For my main entrée (yes, we each also ordered separate dishes), I went with the paneer frankie – soft paneer, sautéed onions and bell peppers, greens, and a spicy mint chutney all wrapped in a romali roti (thin flat bread). I was struggling to finish but you better believe I ate every last bite. It was the perfect combination of textures and flavors. The chutney definitely added a lot of heat and herbaciousness (is this a word?!). The salted lassi I ordered was the perfect cooling element of this meal. Not too thick and definitely not watery in consistency, I really loved how the yogurt flavor came through in every sip. Delicious! 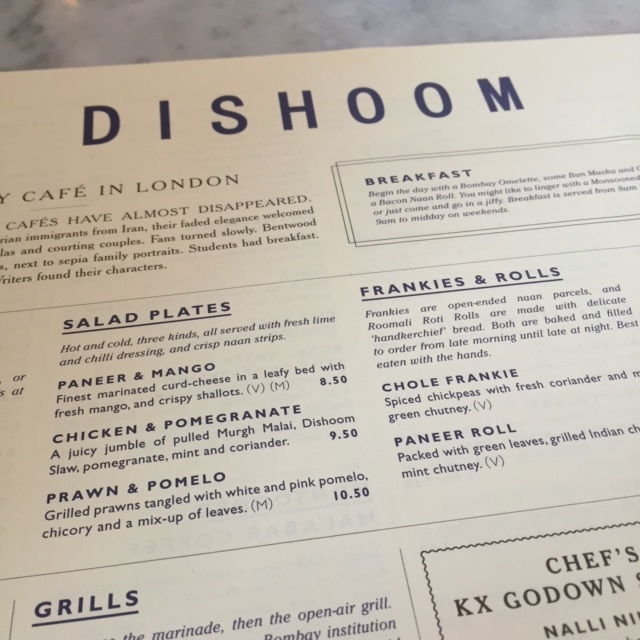 Eating at Dishoom was most definitely an unforgettable experience – from the food itself, to the décor, to the service. I can see why people make it a point to dine here. Other notable restaurants I tried this past week include Pret a Manger (haha! ), All Bar One (went twice for breakfast), Lupita (unique Mexican food), and Kimchee (Korean food). Overall, my trip to London was a lot of fun. It was great to connect with so many people on both a professional and personal level. 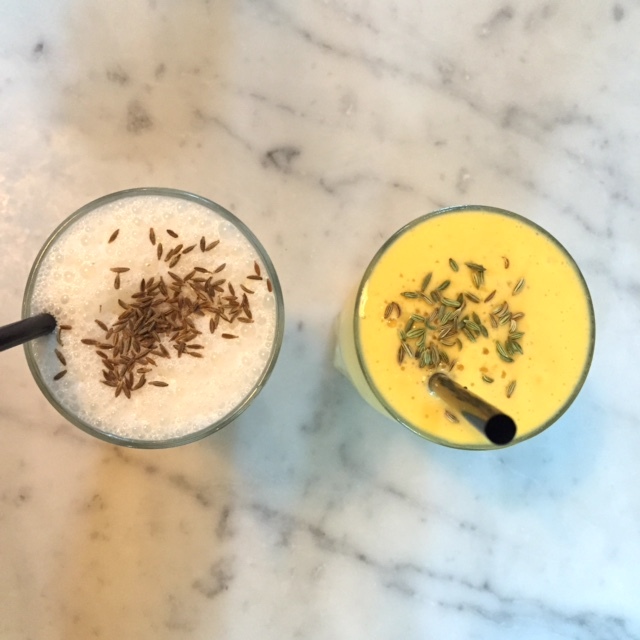 Excited to see what 2016 will bring…hopefully more trips to London (and Dishoom)! Wow! What a gorgeous spread. What is the lassi made with? I hope 2016 brings plenty of London trips for you THAT coincide with mine ;)! I am not usually a fan of eating out at Indian restaurants but you have me convinced- I love the sound (& look) of the paneer roll! I always thought I wasn’t a big fan of paneer but after eating so much paneer tikka this weekend, it’s sae to say that I was mistaken!! This place sounds fantastic! I love Indian food and crave it almost every day. I would have been all over that paneer dish! Sounds delish! I must add this to my London to do list!